Foreign Languages (reading, writing, speaking): English (very good), French (good), Russian (poor). Universite Paris-Sud, France (3 weeks 1995, 3 weeks 1997.
International Workshop on Quantitative Biology, Bucharest, Romania, 14 – 25 May, 2007. Optical properties of photopigments: optical properties of photopigments in organic solvents; model systems for macromolecular chlorophyll-protein complexes obtained in linear synthetic polymers and aprotic solvents; quenching of chlorophyll-a fluorescence by carotenoids and quinones. · Scientific referent at the Romanian Reports in Physics. 2. Laura Tugulea, Doina M. Gazdaru, Techniques and experimental methods in biophysics (practical works and tests), Printing House of University of Bucharest (2003), 229 pages. 3. Doina M. Gazdaru, Biomolecular Interactions, Printing House of University of Bucharest (2007), 220 pages. cellular energetics. Printing House CREDIS, University of Bucharest (2003) 297 pages. 1. 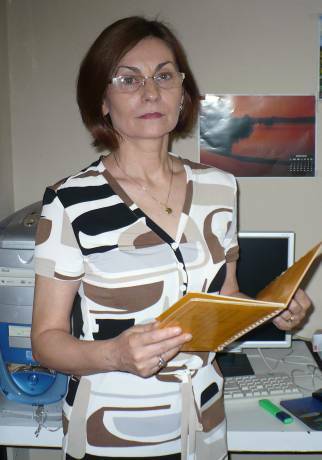 Doina M. Gazdaru, L.C. Petcu, E.M. Franken, T.J. Aartsma, Spectroscopic Investigation of Aggregation of Chlorophyll-a in Solution, A X-th International Congress on Photosynthesis, Montpellier, France, 20-25 aug. 1995, in Photosynthesis: from Light to Biosphere, vol V, 203-206 (P. Mathis ed. ), Kluwer Academic Publishers, 1995.